Much thanks to Mike and his kids for making their mathematical journey available for others to learn from, and also for using our models as part of their explorations! Settings: Printed on a Replicator 2 with raft but no supports, on a glass platform with blue painter's tape, at 80% scale, with two pieces of each color. On .3mm/low the pieces took about 12 minutes each to print and made a model was very tight and difficult to assemble, and nearly impossible to take apart. 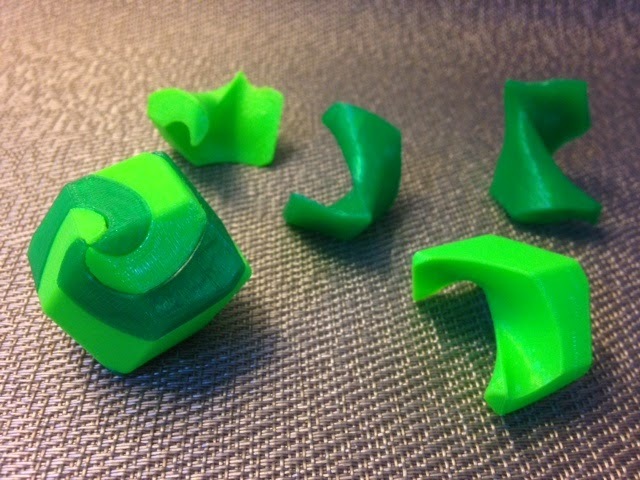 On .2mm/low the pieces took about 16 minutes each to print and have the same problem. Hopefully the clearance will loosen up with repeated use, but if not then I will try to figure out the OpenSCAD code that made this model so that I can increase the clearance. Technical notes, OpenSCAD flavor: VeryWetPaint made their code available and I'm going to attempt to annotate it to make clear how it works. To understand this code you'll need to learn about Minkowski sums and .dxf extrusion in OpenSCAD. Here are some things I don't understand yet about this code: (1) why does it seem like the two helical pieces that are removed in the "difference" operation are so different, and (2) how was the .dxf file made and what is the equation for whatever that helix is? I'll update later if I figure it out; please comment below if you know! UPDATE: Scott Elliott (VeryWetPaint) has uploaded a new .dxf file and OpenSCAD code on Thingiverse with some helpful descriptions and bonus OpenSCAD code in the comments below. Thank you, VeryWetPaint!